SG-1 is captured after a deal with the Lucian Alliance goes bad ... and the planet's Stargate goes missing. Meanwhile, a former System Lord attempts to rebuild his empire. Mitchell, Carter, Jackson, and Teal’c are under fire as they run toward the Stargate, their plan on another planet having gone awry. As Jackson dials home, the Stargate suddenly disappears in an Asgard-like transporter beam. The D.H.D. is likewise dematerialized, stranding SG-1 at the mercy of their enemy. Eight hours earlier, General Hank Landry and SG-1 are briefed regarding the appearance of a highly addictive crop, kassa, that resembles and ear of corn. Colonel Reynolds reports that Lt. Mooney had to be restrained and forcibly returned to Earth when he sampled this food. Teal’c reveals that there have been problems with erratic behavior on several Jaffa worlds, though no one suspected tampering with the food supply. Jackson suggests the Ori could be involved, though this not their usual approach. With orders to keep a low profile, SG-1 sets off to P6G-452 to investigate. After a lively discussion in a cornfield — during which Mitchell suggests Jackson and Teal’c don’t look like drug dealers and Mitchell refers to Carter as “Mary Poppins” — Mitchell introduces himself to a local peasant as “Mr. Shaft.” He asks to be taken to the man’s boss, kassa seller Worrel, a local thug connected to the Lucian Alliance. Mitchell says that he is looking to buy a significant quantity of the kassa and would like to meet Worrel’s superior. Suspicious, Worrel takes Mitchell prisoner. With guns aimed at Mitchell and their own position about to be compromised, Carter, Jackson, and Teal’c move into action, which brings them back to running through the woods in a hail of bullets, seeking escape through the Stargate. When it is whisked away by the transporter beam, Worrel’s men capture the team. On Earth, at the S.G.C., Chief Harriman tells Landry that Mitchell has missed the check-in time … and now the gate cannot connect to P6G-452. Reynolds reports that Dr. Lee has found the kassa to be a highly addictive psycho-stimulant, one that had to be deliberately engineered. Landry contacts the Odyssey, Earth’s newest interstellar ship, under the command of Colonel Paul Emerson. With 90 percent of the systems fully operational, Emerson accepts extraction of the overdue SG-1 as their first mission. SG-1 has the new locator chip implants, which will allow the Odyssey to beam them directly aboard. Bound to a bench, Mitchell, Carter, Jackson, and Teal’c are beaten and interrogated by Worrel, who thinks they stole his Stargate. He doesn’t seem to grasp the improbability of SG-1 stealing the gate before they can escape through it. Harriman informs Landry of a new Tok’ra dispatch detailing the theft of Stargates from at least four other planets. 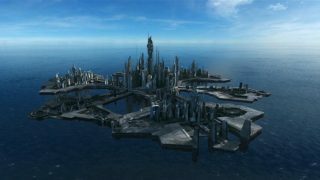 Suspecting the failure of SG-1 to report could be due to gate theft, Landry orders the intel on the involvement of a mothership with Asgard beaming technology forwarded to the Odyssey. Landry decides to confer with Nerus, a captured Goa’uld scientist (“Beachhead”) being held in Area 51. Having determined that his captives are the famous SG-1, Worrell orders them shot. As guns are aimed, SG-1 is beamed to the bridge of the Odyssey. After introductions, Emerson briefs the team on the theft of the Stargates. Over a bountiful first few courses, Nerus confirms Landry’s hunch that Baal is stealing Stargates. By the time dessert arrives, Nerus suggests Baal wants to rebuild, using the gates on non-gate worlds to set up his own empire and regain power. When the question comes up of where Baal is now, Nerus — now quite full — will exchange that information only for his freedom. On board a commandeered Goa’uld mothership now belonging to the Lucian Alliance, an Alliance leader named Netan castigates Worrel for his stupidity regarding SG-1 and the potential loss of two-thirds of their kassa crop, hinting at the Alliance’s deep involvement in the addictive food. Apparently accepting his terms, Landry allows Nerus to leave — with a going-away present of two cases filled with of cupcakes for the gluttonous villain. Nerus immediately locates Baal and his mothership, where he begs to be reinstated as Baal’s resident genius servant. Unbeknownst to Nerus, a locator chip has been hidden along with his desert. The technological devices Nerus had with him have also been implanted with a computer virus, in the hopes of disabling the systems on board Baal’s ship as soon as Nerus interfaces one. The hidden beacon gives Stargate Command Baal’s location, which they forward to the Odyssey. There SG-1 detail their plans to beam onto Baal’s ship when the virus disables the shields, place locator beacons on the stolen Stargates in the cargo hold, and beam themselves and the gates back using the Odyssey‘s own Asgard transporter beam. Odyssey comes out of hyperspace to find Baal’s ship disabled — right according to plan. As SG-1 beams in, Baal goes to Nerus’s room and confronts him. Nerus plays down the problem as a little computer virus, easily eliminated. Meanwhile, led by two-handed gunfire from Teal’c, Carter, Jackson, and Mitchell locate the Stargates — and find far more of them than intel had suggested. As they tag the gates, three ships of the Lucian Alliance arrive, demanding the return of their own missing gates. The Odyssey stands by, intent on their mission, a mission endangered when Baal’s shields come back online. Trapped, Mitchell asks if Carter can find another way off Baal’s ship. The Lucian Alliance attacks, costing Baal his shields, which allow the extraction of the gates by Odyssey. They cannot locate SG-1, however, by the time Baal’s ship is destroyed. Though her shields have held thus far, Odyssey jumps to hyperspace rather than face the Alliance fleet. SG-1 comes through the gate on Earth, Carter having rigged a D.H.D. and gate to send them home before Baal’s ship was destroyed. Pleased with their teamwork and success, Mitchell happily declares theirs the best jobs in the world and the day a good one. VOTE! How would you rate SG-1's "Off the Grid?"